Taj Mahal is India's Pride and Joy and a Wonder of the World. Taj Mahal is no doubt the pride and joy of India. It's also one of the most beautiful pieces of architecture in the world! 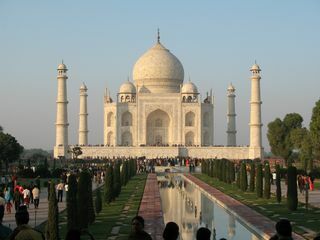 People from all over the world visit India each year, and those who visit are likely to include the Taj in their travels. The Taj Mahal is located in the city of Agra, in the state of Uttar Pradesh, India. Most people don't know that there is a powerful love story behind the Taj! Before we get into the story, let's discuss its beauty! When you first see the monument in person, it takes your breath away! The architectural design is one that is meant to be admired from a distance. It's not known for intricate detail to be viewed up close, bur when looking at it from a distance its arguably the single most beautiful piece of architecture in the world. Not only is the monument itself visually stunning, but their are scenic gardens, landscaping, and a beautiful shallow pool leading directly to the base of the Taj. It's also accompanied by identical palaces to each side. A man by the name of Shah Jahan built the Taj for his favorite Hindu wife, Mumtaz Mahal. Sadly, it was built as an eternal tribute to her after her untimely death. The love story began with the meeting of Shah Jahan and Mumtaz Mahal. Shah Jahan was a Prince born in 1592. He was the son of the fourth Mughal Emperor. Shah Jahan fell in love with Arjumand Banu Begum at first sight. At the time he was only 14 years old and she, a Muslim Persian princess, was only 15. After they met, Shah Jahan went to his father and declared that would marry her. They were married five years later in 1612. Shah Jahan became the Emperor in 1628 and entrusted Arjumand Banu with the royal seal. He also changed her name to Mumtaz Mahal, which means the "Jewel of the Palace". Though Shah Jahan had other wives, Mumtaz Mahal was his favorite and they were never apart; he even took her on military activities. In 1631, Mumtaz Mahal died due to complications during the birth of their 14th child. Her devastated Shah Jahan. Shah Jahan was so heartbroken after her death that he ordered his people into morning for two years. Soon after her death, Shah Jahan undertook the task of erecting the world's most beautiful monument in her memory. It took 22 years and the labor of more than 20,000 workers to build his legacy in dedication to her. This magnificent monument was named "Taj Mahal", and is now considered one of the Seven Wonders of the World. The Taj Mahal also serves as the tomb of both Shah Jahan and Mumtaz Mahal. So now, when you gaze upon the wonder and the undeniable beauty of this monument, you can relish in knowing that it was built out of eternal love. This is why it is one of the top India honeymoon destinations! Leave Taj Mahal to explore other tourism destinations. Discover what it's like in India today! Learn more about the Taj. Continue exploring India from our homepage.